Michael has been practicing law as a solo practitioner since November, 1989 He has been at his present location since 2001. His practice focuses in the areas of criminal defense(adult/Juvenile), traffic citations, wills, deeds, dissolutions, adoptions….While his practice is generally limited to the courts in Butler County, he has a network of other attorneys he feels comfortable in referring cases in other counties which may contact him initially. His business has been Better Business Bureau accredited since 2015. 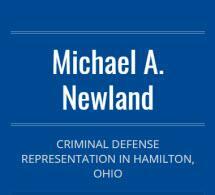 He is a member of the Ohio State Bar Association, Butler County Bar Associatio, Ohio Association of Criminal Defense Attorneys,and National Association of Criminal Defense Attorneys. His civic involvement includes membership in the Greater Hamilton City Chamber of Commerce and Fairfiel CityChamber of Commerce. His practice strives to effectively represent and protect his clients' intersts and rights. Michael graduated from Edgewood High School in 1981. He received a BA in American Studies from Georgetown College in 1985. He obtained his Juris Doctor degree form Capital University in 1988.